For my last post of 2014, I want to throw a little love towards my sewing machine. 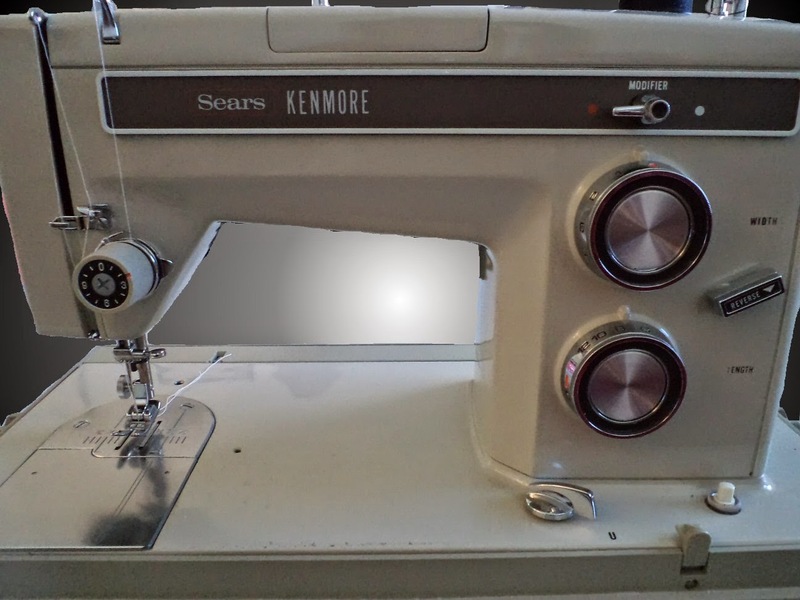 I sew on a Kenmore Model 1720 (zigzag), purchased from the Sears catalogue. I "took possession" of it on April 14th, 1977. Which means that it will turn 38 years old next year. The only way that I know any of this is that I recently found the manual for it. I had forgotten that it was purchased that long ago. It wasn't cheap, either (in terms of late 1970s dollars), being over $200. That said, this machine was probably quite "state of the art" at the time. But I was recently checking out Craftsy's Sewing Machine 911 (free) mini class and found out that my machine is classified as "vintage". How can I tell? Well, it's heavy — made completely out of metal — and has the classic appearance of needing to be mounted into a cabinet. (Mine sits on the bottom half of its carrying case. In fact, under the machine inside that case was where I found the user manual.) The tension control disks are also on the exterior of the machine. All of the controls are mechanical: dials, push buttons and switches. This machine came with four presser feet: one for regular straight stitching (that I actually like to use for zippers since it has a slim side on it that can butted up against zipper teeth; I also like to use it when topstitching very close to an edge), one for satin stitching, one for zigzag stitching (not shown here; it's on my machine), and finally, an actual teflon zipper foot that can be adjusted side to side and can be used for piping! A little bit of online research brought forward some very interesting information. Apparently these old machines — much like my hubby's 1969 classic muscle car — are sturdy workhorses that just won't quit. (They've been compared to today's industrial machines in terms of quality and capability!) And the thing is, when I brought this sewing machine up from Mom's basement a little over two years ago, it never occurred to me that it wouldn't work. I watched as Colleen squirted a little bit of oil in the appropriate spots and I've been off and running ever since. What maintenance have I done on it otherwise? Not a whit! At least, not until I was attempting to make my fourth buttonhole when I was making testers for my MyTie Makeover Mini Bag. I have never even changed out the little light bulb, for cryin' out loud. Have you ever seen the inside of your machine? They consist of an alternate bobbin access cover with a mechanism on the bottom and a little gear on top, and a plastic button hole making "template" that fits on top of it. And here is the back side of this special bobbin access cover, showing what the little gear actually controls. When the buttonholer is in use, the part that is attached to the spring moves back and forth (as shown by the red arrow) as the gear turns. What ended up happening was that the piece wasn't moving back and forth (with the result that I was stitching repeatedly in one spot on the buttonhole I was making). So I examined it, plucked at it and noticed that the part in question frequently stayed in the expanded position instead of springing back like it was supposed to; obviously something was wrong and I was initially thinking it had to do with lubrication. With the help of my little Kenmore screwdriver, I opened up the back cover and found that the movable part moved perfectly fine. Hmmm... maybe it just needed to be opened up. After all, sometimes you just can't explain why things are the way they are. I open it up again and find that — once more — the springy part springs back just as it's supposed to when it's pulled. So what the heck? For some reason, it occurs to me to screw the back piece on only tight enough to keep it closed, just in case I need to go back in. Only now, the whole contraption appears to work just fine. I tighten up the screw... and the piece doesn't spring back when pulled. Anyway, I lightened up on the tension in that one screw (where my screwdriver is pointing to in the picture) and my buttonholer worked like a charm again. Go figure. But after reading all of the online tributes to the venerable vintage sewing machines, I am perfectly happy to stay right here with my Kenmore 1720. It may outlast me. Rochelle I bought a very similar Kenmore machine around that same year as yours. It was the first sewing machine I purchased myself. Unfortunately, being a young and rather naive person, when I started having tension issues and was frustrated I bought a nicer more expensive Pfaff (second hand). In hind site I wish I hadn't gotten rid of my Kenmore and I know it was probably my own fault it was having tension problems because I should have cleaned and oiled my machine, changed the needle, etc. because I just wasn't too smart about such things. I also ended up selling the computerized Pfaff years later because it had so many functions that I didn't use, I wanted to go back to a simpler more basic easier to use machine. So live and learn. I am sticking to the machines I have, which include 2 Brothers I purchased new a few years ago and a couple of 2nd hand machines, an old Bernina 830 Record, and old Singer 301A. I like them all and each does something better than one of the other machines. You can't get everything you want in one machine no matter how pricey the machine is. I think all 4 of my machines together cost what that 2nd hand high end Pfaff cost me back in the early 1980's! Live and learn is so true. I'm almost glad I didn't have the interest in sewing back then to chase other machines, having heard similar stories from others. Until this one gives up the ghost, I am perfectly happy to live with what I have. Ooooh, I,am SUPER jealous of the teflon adjustable zipper foot! I LOVE my zipper foot, for zippers, gussets, piping, topstitch ing....and to have one in teflon too? Squeal....lucky girl! LOL... you know what? That zipper foot was stored at the bottom of my Kenmore accessories box for the longest time because I originally didn't know what it was really for! ("What's with this plastic thingie?") I truly only uncovered it about a year and a half ago.